The Symphony Air Cooler DIETI50 is where innovation, intelligence & electronics come together. With a perfect combination of style and effective cooling, it boasts of high performance. It is a residential cooler which is ideal for rooms of up to 25.sq.m./250 sq.ft. With a powerful 37 ft. Air Throw with auto swing features, the cool breeze reaches every nook and corner of your room. The 5o litre tank capacity, there will always be enough water for cooling purposes. The cooler comes with high efficiency honeycomb pad and Ice Chamber for effective and enhanced cooling. 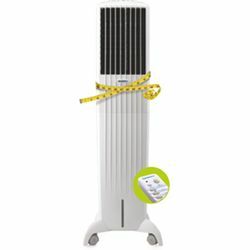 The Symphony Air Cooler is very easy to operate with a remote control which comes with a 7 hours timer. In its category, it is one the most energy efficient air coolers as it consumes only 175 watts of power. The pump installed in it is extremely durable for a long life as it uses the dura-pump technology. For usage, the cooler is very convenient for the user. As and when the water tank starts to get empty, it will ring an alarm. It blows as powerfully with its 7 inch blower. A feature called System Restore Function restarts the cooler with the same settings. You can also connect it to inverters to produce clean and fresh cool air. You can even use the cooler outdoors. It occupies less floor space but delivers incredible energy efficiency. Shop for the amazing cooler at a slashed price and beat the heat in the best way! The Symphony Air Cooler DIETI50 is where innovation, intelligence & electronics come together. With a perfect combination of style and effective cooling, it boasts of high performance. It is a residential cooler which is ideal for rooms of up to 25.sq.m./250 sq.ft. With a powerful 37 ft. Air Throw with auto swing features, the cool breeze reaches every nook and corner of your room. The 5o litre tank capacity, there will always be enough water for cooling purposes. The cooler comes with high efficiency honeycomb pad and Ice Chamber for effective and enhanced cooling. The Symphony Air Cooler is very easy to operate with a remote control which comes with a 7 hours timer. In its category, it is one the most energy efficient air coolers as it consumes only 175 watts of power. The pump installed in it is extremely durable for a long life as it uses the dura-pump technology. For usage, the cooler is very convenient for the user. As and when the water tank starts to get empty, it will ring an alarm. It blows as powerfully with its 7 inch blower. A feature called System Restore Function restarts the cooler with the same settings. You can also connect it to inverters to produce clean and fresh cool air. You can even use the cooler outdoors. It occupies less floor space but delivers incredible energy efficiency. Shop for the amazing cooler at a slashed price and beat the heat in the best way!